The final, official trailer for the latest epic from director Christopher Nolan (The Dark Knight Trilogy, Inception, Interstellar) has arrived and it looks rather glorious. This is easily my most anticipated film of the summer. Dunkirk was shot completely on IMAX 65mm film and 65mm large-format photography with Nolan and Interstellar cinematographer Hoyte van Hoytema reuniting once more for what will hopefully be a World War II film for the ages. While my concern with Dunkirk comes more out of the fact the market for WWII film is rather saturated these days than any worry with Nolan or the story he wants to tell there is a certain familiarity with these types of images that no longer allow them to feel as fresh no matter what scope one is shooting on. That said, the imagery we get here in this extended trailer only reinforces the beauty the filmmakers have found in this tragic event. The story concerns the real-life events of the evacuation of Dunkirk, known as Operation Dynamo, during the British military operation that saved 330,000 lives as Allied soldiers were surrounded by German forces. Nolan wrote the screenplay himself without usual collaborator, brother Jonathan, but the picture will reunite the director with longtime collaborator/composer Hans Zimmer. We already seem to know there is no one particular protagonist, but rather that Nolan's film will consist of several different perspectives on similar scenarios that will only stand to increase the tension within each of these situations. 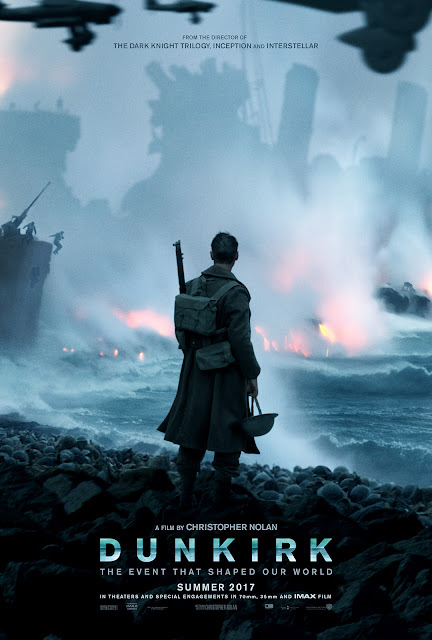 Granted, I'll see anything Nolan decides to put his time and effort into so all of this may not exactly be saying much, but nonetheless the idea we're getting a WWII film from the perspective of one of our great modern filmmakers is nothing to be dismissed. Dunkirk stars Tom Hardy, Kenneth Branagh, Mark Rylance, Cillian Murphy, Aneurin Barnard, James D’Arcy, Jack Lowden, Barry Keoghan, Tom Glynn-Carney, Harry Styles, and opens on July 21, 2017. Synopsis: “Dunkirk” opens as hundreds of thousands of British and Allied troops are surrounded by enemy forces. Trapped on the beach with their backs to the sea they face an impossible situation as the enemy closes in.